Burberry Plaid Drapes, a designer solution - Sew What? Sew Anything! This burberry plaid drapes window treatment was for a client who had just downsized into a retirement condo. The client had been a buyer many years ago at Jacobson’s, a mid-Michigan high end department store. He had acquired this timeless fabric for a window display which never happened. He had 15 yards of the Burberry fabric, and hoped it would be enough to be made into drapes. The fabric was not designed for draperies and needed an inter-liner to give it more weight and firmness in order to hang nicely. The result was perfect for the client who now has a great set of designer drapes. 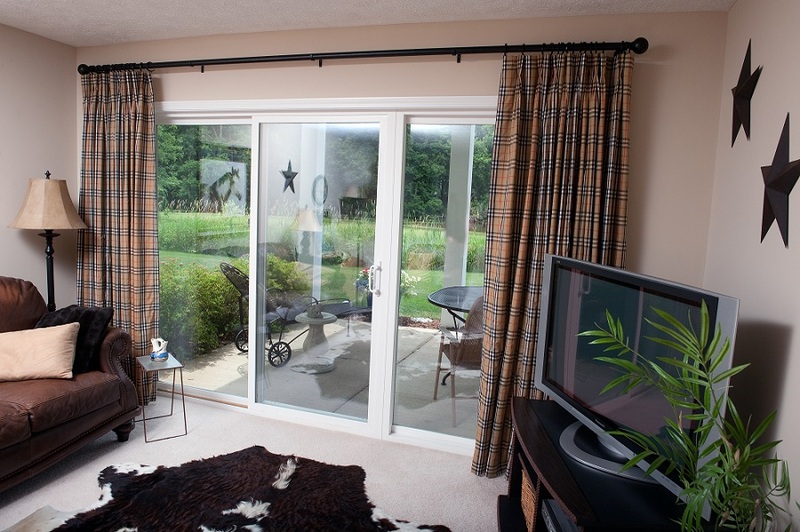 A J Ennis curtain rod was used to hang these curtains. Using this rod gave us the large rod needed to cover the window expanse. The curtain rod rings have a plastic lining on the inside which allows the rings to glide over the curtain rod smoothly for easy opening and closing. The signature Burberry pattern sets a fresh masculine tone for the room design.